Our school provides an enriching experience with learning activities that purposefully engage each child. We encourage academic curiosity, integrating diverse topics with traditional subject matter. Teachers provide guidance, but every achievement is a student's own. We are dedicated to their future. We are proud to have Certified Montessori instructors, in accordance with the standards of the American Montessori Society, the Southern Association of Colleges and Schools, and the Southern Association of Independent School, present approved materials and instructions. Since we were founded in 1967 we have achieved accredited academic excellence while offering an educational option to the Memphis community. Lamplighter Montessori School was privately owned until 1990; it then became a board-run, non-profit organization. Our programs range from toddler classes (starting at 18 months) through the 8th grade. The Montessori method is an effective educational program that fosters maximum achievement for students. They become confident, intrinsically motivated, lifelong learners. A variety of learning experiences and authentic assessments are used to demonstrate student mastery. Lamplighter is a community of learners and each member is valued as an individual with unique intellectual, physical, social and emotional gifts. Teachers, staff, administrators, board members, parents, students and community members share responsibility for creating a supportive learning environment within our school The Lamplighter Montessori School community is committed to continuous school improvement. 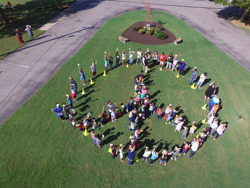 Lamplighter Montessori School is proudly located on nine wooded acres in Cordova, TN. We are home to a diverse student body that is growing strong as we prepare students for their bright futures.